Any student with a strong academic background may apply to complete an honors project in the department or program of her major. A successfully completed thesis project leads to the awarding of the bachelor of arts degree with the notation "honors," "high honors" or "highest honors" in the student's major subject. Honors students' names and the titles of their thesis projects are listed in the Commencement program. You may only earn honors in one major. 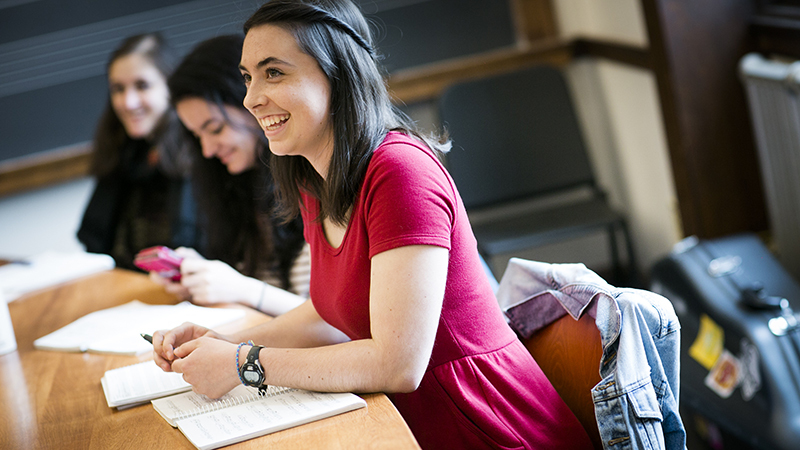 Eligibility for admission to the honors program is determined by each department or program. Consult the director of honors in your department or program about eligibility and deadlines. You must be in residence in Northampton for the duration of the honors thesis project. To be enrolled in departmental honors you must certify that you have not been sanctioned by the Honor Board at a serious level (one-third-step grade reduction or more) for a violation in your sophomore, junior or senior year. If you receive a sanction from the Honor Board during your senior year you must convert your honors project to a special studies. If you are considering a thesis project, talk with the director of honors in your department or program during your junior year. You will need a faculty adviser for your thesis project. Consult with the director of honors in your department if you are unsure about whom to ask. Your primary adviser must be a member of the Smith faculty in your major; faculty at other Five College institutions may serve as second readers. Honors students must be enrolled in at least 12 credits (which may include the thesis). Ada Comstock Scholars should consult the Ada Comstock Scholar dean about credit. Not all departments offer all options; consult the course catalog or ask the director of honors in your department. Your proposal must be approved by your department or program and the Subcommittee on Honors and Independent Programs (SHIP) before you are officially registred in the course, usually during the third week of the semester in which you start your thesis. You may, with the endorsement of your adviser, transform a successful first-semester project in your major into an honors thesis in your major in the second semester of your senior year. You will need to submit an honors proposal to your department by the first day of the second semester of your senior year. Consult the directors of honors list above if you are interested in this possibility. All thesis projects are archived electronically at the Smith Libraries. The library needs permission from you in order to catalog your thesis. You must sign the Smith College Libraries Permission Form for Honors Project. Deliver a hard copy to Mary Lou Bouley, Collection Services, Neilson Library. If you do not submit the form your thesis project cannot be catalogued. The library offers a variety of resources to assist students with honors projects. The college-wide honors program is administered by SHIP under the Committee on Academic Priorities (CAP). Send questions to the dean of the senior class, who serves as chair of the subcommittee, at honors@smith.edu.